Kids love to play and jump around freely and what better than to provide them with a trampoline. 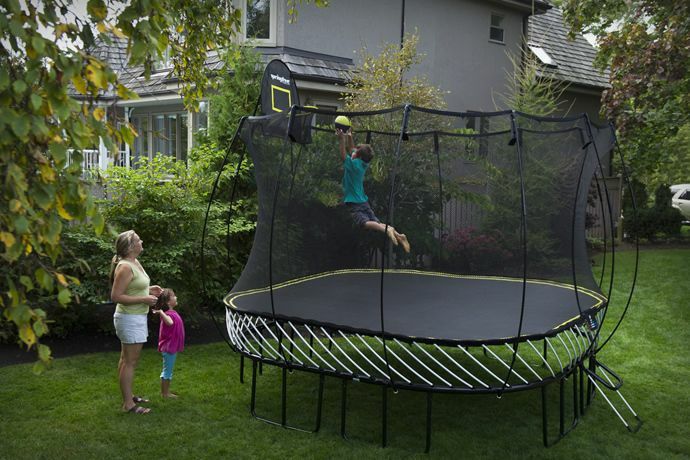 Parents around the world keep the safety of the trampoline as their priority. They make sure that their kids do not hurt themselves and keep a close watch. There is much equipment available in the market that installs trampolines safely and makes sure that the children are not harmed in any of the ways. The primary concern for installation is a leveled ground and, trampoline leveling kit makes sure that the land is flat before installation. This kit is also useful for places where the perfect leveling on the ground is not possible, at such places measures are taken to level the trampoline by other means. 1. Springfree Trampolines are considered the most reliable as they minimize the injury on fall. Springs are replaced with flexible composite rods, placed under the jumping area that prevents kids from getting hurt upon falling. 2. Flexible Safety Enclosures are provided around the surface area to avoid fall. They are made of soft material that is strong and provides cushioning to the jumpers for a pleasurable experience. 3. Hidden Frame is placed well below the jumping surface which reduces the possibility of landing on it. It is made of good quality metal that can provide the needed support. 4. Soft Edge Mat is placed around the periphery that is shock absorbent and prevents any injury to the jumper. It gives the freedom to jump throughout the surface without worrying about banging into the edge. 1. Do Not Flip: Jumpers who are not trained should not try to flip on the trampoline as this may cause serious injury to their head or neck. Spinal cord and the vertebral column are one of the most critical parts of our body. Any leniency on our part can lead to severe consequences. 2. One Person at a Time: It must be seen that only one person jumps at a time, especially children. More than one jumpers on the same trampoline are prone to collision, and this may result in serious injuries. 3. Parent Supervision on Jumping: Parents or an adult must always supervise children while jumping. Children find it difficult to balance their jumps, especially if they are beginners. They are the most excited lot among us, and they try new ideas of jumping which may be fatal sometimes. 4. Keeping the Net Locked: Always lock the net during jumping sessions. It reduces the chances of fall to the ground. You will agree with me that how important it is to follow all safety measures when someone as important as your child is involved. Several steps are taken by the people who install trampolines and of course the parents who get them for their children to make jumping a pleasurable experience.